Or is it doughnuts? Neither spelling works for me. 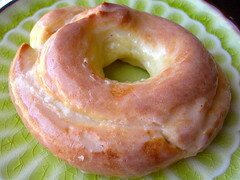 I've had my eye on the recipe for French Crullers in A Passion for Baking for some time. Can you really make donuts without frying them in oil? My house is divided. These are made by making a Pâte à choux and piping it onto a few pans, then baking and glazing them. They were quick and delicious! I'd make these again. When I first got my copy of Simply Spectacular Cakes, I thumbed through it in awe at the precise and beautiful cake and cookie creations. I was a little bit intimidated, actually. I started with these beautiful cookies. I had never tried royal icing before, and decided to do all monochromatic to make elegant little tea pots. 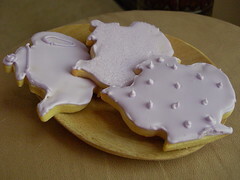 The cookie recipe was good, making nice sturdy sugar cookies. The icing was easy to make and use. But then there were the cakes. I kept "intending" to make something spectacular. I even went all the way to the one store in my town (the largest city in my state, actually) that has a good selection of cake decorating supplies, and still couldn't find everything I'd need. Not knowing enough about using fondant and gum paste, I wasn't sure what could be substituted, and I was completely hopeless at finding liquid fondant at all. Despite the detailed listing of ingredients and tools for each recipe, I was left not knowing how to substitute or wing it. Sad, because I really wanted to make the cute little cherry blossom petits fours on the cover for my birthday! This cookbook is beautiful and has some great ideas - but I'm not so sure I can get behind the "simply" part of the title. Spectacular, indeed. To make the best use of it, you should find a good cake decorating vendor that has such things as liquid fondant, since the author does not provide recipes for some of the required parts. What she does provide are detailed step-by-step instructions that are helpful at instilling confidence. Many of the steps are illustrated. And by the way, I'd still like to go for the most complicated recipe, just to say I'd done it, but I need a few names of places to order supplies from. If you know of a place, please leave me a comment! In January, I made some culinary resolutions for 2010, and I haven't done much with them. I decided this was the weekend I'd make my third laminate dough - croissants! It is a 2-3 day process, so I started Friday night and finished today at noonish. I used the recipe from Baking with Julia, because that has been my primary resource for my other pastry endeavors, including puff pastry and danish pastries. It made sense to go ahead and make the triumvirate! If you follow me in Twitter, you have read about my journey. Rather than post a photo of it, I'll link to each step. There are many. First I made a yeasted dough and prepared a butter layer (over a pound), and chilled them separately overnight. 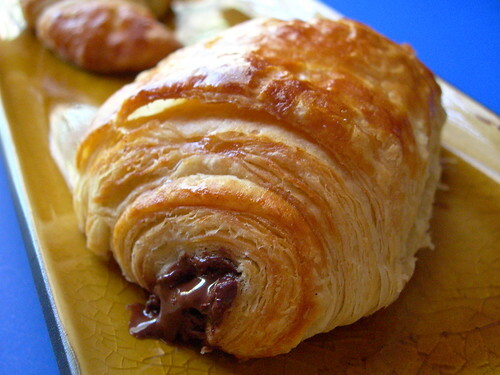 The incorporation of the dough and butter are what make croissants a laminate dough, since the process creates the many layers that we look for when we bite into a flaky croissant. 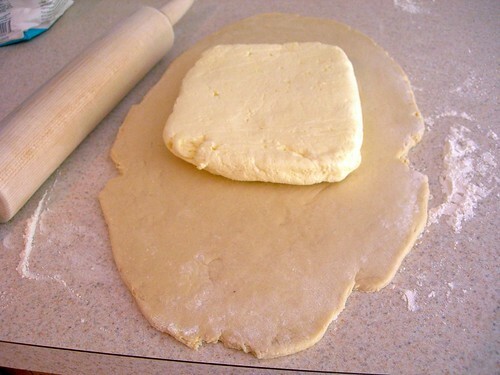 At first, you literally fold the dough around the butter and roll it out. Between each roll and fold (or, a "turn,") the dough has to be chilled for two hours or so, because it needs to stay cold. Otherwise it could get greasy and unpleasant. I did all the turning and rolling out on the second day. After all the turns, the dough gets a final double fold, sometimes known as a wallet fold, before its last rest. At this point I wrapped it up and put it in the fridge overnight. Croissants, at least this recipe, are a bit troublesome if you are trying to make them fresh for breakfast, because the completed pastries have to sit for four hours at room temperature before baking. Rather than get up super early on a lazy weekend, we decided that croissants would be just as good at lunch. I do wonder if I could have made the croissants and then put them in the fridge overnight. The third day, the dough was sufficiently chilled and was ready to be rolled out. I cut it in half like the recipe recommended, and rolled it out to 24x14 (ish). 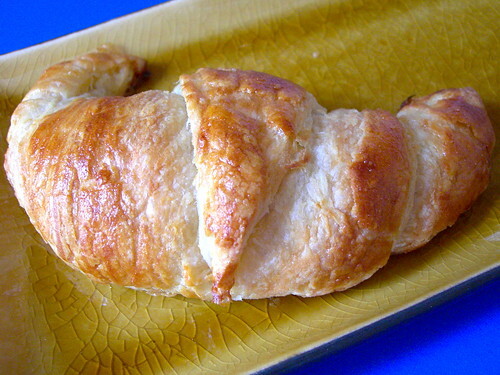 Making croissants would be a great arm workout, actually, if you didn't eat the final product. I had decided that half the dough would be made into standard croissants, and the other half would become pain au chocolat. The first half was rolled out thin, folded in half, and cut into triangles. The scraps get incorporated into the croissants too, so nothing is wasted. The dough is then unfolded and the triangles and diamonds are cut in half, so the half batch of dough yields about 12-14 croissants. The most difficult stretch was stretching the dough. The recipe said to be firm and really grasp it, but when I did I tore through. I used more of a pizza dough technique where I pulled gently and used my knuckles to slowly stretch the dough. The goal was to stretch it to twice its length, which I tried to do but didn't always manage. Then a bit of the scrap dough gets added before rolling the croissant, to add some plumpness to it when it bakes and give it that croissant shape. The croissants are left to rest uncovered, after being washed with an egg wash, for about 4 hours. The other half of the dough was formed into pain au chocolat, which is a little easier than croissants, because you don't have to do any dough stretching. You simply roll out the dough to the same thinness, cut it into strips, and wrap each one around a piece of chocolate the same width of the dough. I used Maya Gold chocolate from Green & Black's because it is organic and I thought the citrus and spices would be a little surprise from the typical chocolate croissant. Plus, all G&B chocolate has a pattern of thin strips, making it easy to break into the perfect size for pain au chocolat. I used bittersweet for half of them, which I think is a little too dark for this pastry, even though I read it was the classic chocolate to use. The verdict? Amazing. The recipe was perfect, the croissants had that crunch that is so often missing from commercial products (because they are not using butter! ), and it was worth all the effort. We had a few with brie for lunch today, and look forward to munching on and sharing the rest.